Looking for a new Southeast Asian travel hotspot to explore and enjoy? The glistening city of Bangkok might satisfy your fancy. Littered with ornate shrines and home to a brilliantly vibrant nightlife, Bangkok is a city of contrasts that will give you a glimpse of Asia through a familiar yet absolutely unique lens. If you’re sold on your decision to hop on a plane and jet set your way to this exciting destination, be sure to keep this short list in handy to help make your trip easy, safe, and enjoyable. Flex Your Haggling Muscle – Unless it has a fixed price or a barcode slapped on its side, you can haggle for it. But in Bangkok, a confrontational tone might not always work in your favor. In this city, sellers are more willing to slash down their prices if you’re friendly and reasonable, so smile and be nice when looking for discounts. If they refuse to cut back the cost and you think the offer is unreasonable, don’t be afraid to walk away. You might just be called back for a last-ditch discount. Bring Enough Water – For those coming from the west, prepare yourself for stuffy, sticky, and stifling humidity and heat all vacation long. As a general rule, you will want to drink more water than you sweat. But because there’s no way to measure how much fluid you lose throughout the day, it would be wise to just set a drinking schedule every hour. Go All Out on Accommodations – If the weather outside isn’t ideal and if you’ve got nothing else to do, it would be nice to at least have a nice place to cozy up and relax. That’s why you shouldn’t be afraid to live a little when it comes to finding accommodations. It’s possible to grab hotel deals in Bangkok that will make you want to stay in for the whole trip, if you look well enough for them. Leverage the Train System – If you’re up for the challenge, you can take the train and see how good you are at navigating this busy city. You’ll have two options: the first is the Skytrain which flies over traffic, and the second is the underground. Travelling couples might have fun learning the new system, but travelling families might be more comfortable with other commute options. Get an Address – There is a bit of a language barrier in the city, and this can be difficult if you’re trying to get to a specific place. Before you leave your hotel, ask one of the staff to write the address of your destination in Thai for you. Simply flash the slip of paper to your taxi driver, and you’ll be well on your way. Don’t forget to tell the driver to turn on the meter so you won’t have to worry about inflated costs. 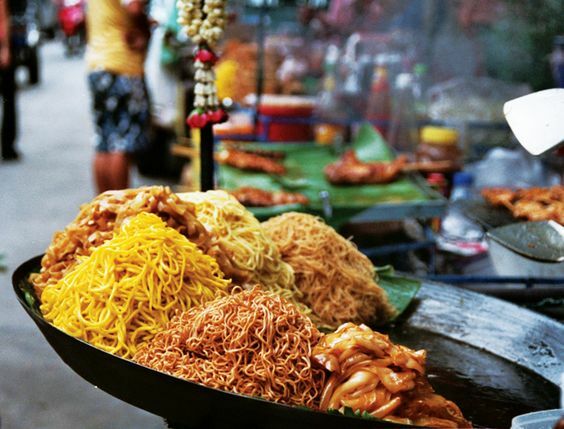 Learn to Explore Food – While many of the street food stalls might look iffy, they’re going to be a whole lot cheaper – and perhaps a whole lot tastier – than any food you’re going to find in restaurants. Learn to explore food options and don’t be afraid to buy something to munch off the side of the road. Are you ready to travel through Bangkok? Save a little and enjoy a lot when you take that trip to this unique capital city. Make the most of your travels and discover the beauty of Thailand by taking these simple tips with you.